In a study of faculty experiences using lecture capture systems in the classroom, responses reveal 10 primary themes around how the technology is impacting the education process. Lecture capture, a teaching and learning tool that allows faculty to record and post the audio, video and presentation content of classroom lectures and the classroom experience, is a boon for students who want to access the material at their convenience for review and supplementary instruction. And it can be a life saver for students who miss all or part of class, or who discover their notes are incomplete. But how do faculty perceive the technology in today's higher education classrooms, and what impact is it having on the educational process? In my graduate work in education, I conducted a study to gauge the experiences of faculty who use lecture capture systems in face-to-face class meetings at small- and medium-sized colleges and universities across the United States. Through telephone interviews, 17 faculty shared their perceptions of the technology. From their responses, 10 themes emerged: pedagogy and instructional content; presentation style; innovative uses; technical support and technology capabilities; institutional leadership and lecture capture adoption; dynamics of class discussion; understanding course content; attendance; educational benefit; and lecture capture as an instructional tool. Slightly more than half of the faculty in the study perceived that lecture capture use has not changed their pedagogy. These faculty did not feel it was necessary to make changes to how they conducted class in order to accommodate the use of lecture capture. Several faculty, however, cited examples of how their instructional content has changed because of lecture capture. One faculty member stated, "Since we are on lecture capture I am a little more careful to prepare an outline ahead of time, where I designate just for myself the time frames for each subtopic of the lecture — so I can sort of stay on topic a little bit better." Nearly two-thirds of the faculty cited specific examples of how using lecture capture has improved the effectiveness of their teaching. More than half of the faculty view recordings of class meetings as a self-evaluation technique to improve their teaching effectiveness. One faculty member reported, "Lecture capture has made me rethink what is really needed in the class. When I am recording it or viewing it after the fact, I have the opportunity to ask myself the hard question and say, 'Did I really need to go into that level of detail in this particular topic or on this subject?'" Faculty expressed only minimal concerns regarding negative effects on presentation style related to the pacing and repetition of content presentation, eye contact with students and freedom of movement around the classroom when using lecture capture. Many faculty believed their performance style had changed and considered that to be a benefit. Some faculty believed using lecture capture made them more conscious of their speaking style, and caused them to be more careful about what they said and how they said it. More than half of the faculty believed using lecture capture did not change their pacing of content presentation during lectures. Several faculty perceived that when using lecture capture, they repeat themselves fewer times and do not linger on topics. Most faculty believed that using lecture capture did not affect the amount of eye contact they had with their students in class. One faculty member stated, "I just thought of the camera as one more student. I just made sure I was giving equal eye contact time to all of those people." More than half of the faculty believed using lecture capture made them more intent on being a good performer in the classroom. Few faculty perceived that using lecture capture prevented them from moving around the classroom freely during the class session. 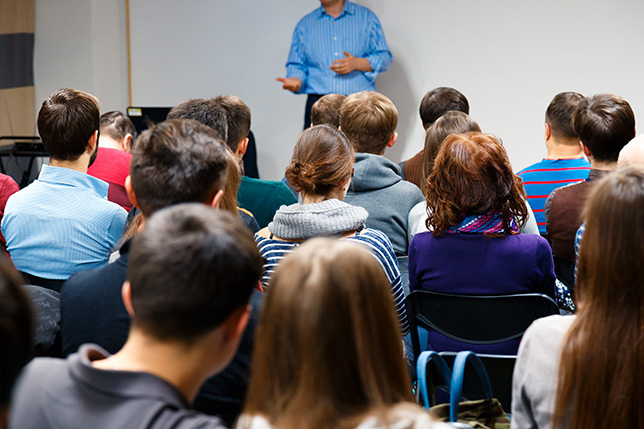 Several faculty indicated they were more conscious of their speaking style and tried to reduce the use of words like "uh" when a lecture is being recorded. One faculty member mentioned that lecture capture makes her more careful about what jokes she tells in class. Another stated that being recorded with lecture capture made her very conscious of body position, voice inflection and personal idiosyncrasies. Class recordings are viewed by the faculty member to confirm the accuracy of specific content presented in a class meeting, answering the question, "Did I say that correctly in class today?" or for general quality control. After administering an exam where many students missed the same question, the recording of the corresponding lecture is viewed to determine if the faculty member's explanation of the topic was inaccurate or unclear, and adjustments are perhaps made to exam grades accordingly. Class recordings serve as samples of faculty members' teaching, used as artifacts for their electronic teaching portfolios. Class recordings are viewed by the department chair for periodic evaluation of faculty member teaching performance. This allows the department chair to view random class meetings instead of attending just one or two class meetings, which might not be representative of the faculty member's typical performance. Class recordings serve as a safeguard against claims by students that the faculty member is a poor instructor. Lab experiments are recorded in advance instead of having students attend in person, for cost or safety reasons. Lectures are pre-recorded in anticipation of the faculty member missing class to attend a conference. Students can be given the assignment to view the lecture, so that content delivery can continue even when the faculty member is not on campus. Classroom activities are recorded when a faculty member is away, but class is held with students assigned to lead various classroom activities. The instructor can view the recording to verify what occurred in his or her absence. Guest speakers are recorded so students in future course sections can benefit from hearing that guest speaker, without taking the speaker's time to make a return visit. Recordings of a course previously taught by another faculty member are viewed by the current faculty member to glean instructional content and pedagogical ideas. Student presentations are recorded so they can be viewed and critiqued, or be used as evidence of student performance if the student disagrees with the grade received. Class sessions are recorded when students are taking an exam, to discourage cheating. Additional lecture content is recorded after the class meeting to cover topics time did not allow to be covered during the regular class meeting. Students are allowed to enroll in two courses that meet at the same time. The student watches all of the recordings of one class and makes special arrangements to take exams at a separate time. Faculty felt that ease of setup, ease of use and readily available technical support are essential for success with lecture capture systems. Most faculty perceived that the required setup and management time for lecture capture was minimal, and that managing the recording of the lecture during class did not distract them from their primary classroom duties. One faculty member stated, "The system itself is probably one of the easiest technologies I think I have ever used." Several faculty expressed the importance of helpful, highly available technical support and assistance for the lecture capture system. Faculty noted inconsistent support for and understanding of lecture capture technology among institutional leaders. Many faculty described the uneven adoption of lecture capture by colleagues at their institution. Most faculty members perceived their use of lecture capture to be optional. More than half of the faculty interviewed stated they use lecture capture regularly in courses they teach if lecture capture technology is available in the classroom they are using. Faculty generally reported that only a portion of campus classrooms were equipped with lecture capture technology. Many faculty noted that adoption of lecture capture technology varied by department within their institution. One faculty member commented, "We are the only department on campus that uses it on a very regular basis." Nearly all interviewed faculty believed that lecture capture has not significantly changed the classroom discussion dynamic. Some faculty believed that students are generally used to being video recorded in their day-to-day lives with various types of technology, such as video cameras or cell phones. One faculty member observed, "If you live in our society, you are on camera all the time pretty much anyway." Another stated that today's students are from a generation where everything has a technology solution, and that lecture capture is unobtrusive. Lecture capture becomes part of the standard classroom experience, and, after a short period of time, few students seem to notice it. Nearly half of the faculty indicated that lecture capture technology did not impede their movement around the classroom, allowing them to engage students in class discussions. A faculty member characterized his experience in the following way: "Sometimes I'm seen in the recorded picture, and sometimes I'm not. I'm kind of like the weather guy … sometimes he just walks off the screen and the seven-day forecast is up there, and then other times he is there talking. I walk around and sometimes I am on camera and sometimes I am not." Interviewed faculty generally believed that lecture capture positively affected the instructional process of teaching and learning course content — helping augment understanding for some students and in certain situations. However, faculty did not generally believe that student understanding of course content was increased among all students and in all situations. Faculty mentioned the benefits of repetition for learning course content, and the ability of lecture capture technology to provide that repetition. Several faculty emphasized that lecture capture complements and enhances student understanding of course content. One faculty member stated, "I felt like my students had a deeper understanding of the concept. I asked one student one day after class who had talked about watching the lectures online. She said to me, 'You know, what I like about it is that I can pause a video, think about what you just said, and even run it back a little ways, then listen to it again to make sure that I heard it correctly. We can't do that in class. There are times in class when I don't want to ask you to repeat something because I know we only have 50 minutes or an hour or however long we had. I did not want to stop other people, and I did not want to interrupt the flow. But when it is just me and that play button, I can pause and I can run it back or I can run something forward if I need to. I feel like I can really get deep into the material.'" Faculty generally believed that having recorded lectures available for later viewing did not cause students to write fewer notes during class meetings. Several faculty emphasized that students have various learning styles, and some faculty believed that, for many students, writing notes is not a beneficial factor for their understanding of course content. Some faculty believed that the availability of the lecture content in the form of PowerPoint slides may be a larger cause for lack of note-taking than the availability of lecture capture recordings of the entire classroom experience. Nearly two-thirds of the faculty stated they had not observed any change in student attendance patterns when lecture capture was used in a course section. Some faculty reported that they require class attendance or set high expectations for attendance, so skipping class is not really an option. Several faculty reported that they make a special effort to prevent attendance patterns from changing, such as not recording all class meetings with lecture capture or administering quizzes. Faculty emphasized the benefit of having lecture capture recordings available for students who must miss class. One faculty member stated, "It hasn't really changed the attendance pattern, but it definitely changed the ability of the students who were going to miss anyway [for athletic event participation] to get the material." More than two-thirds of the faculty believed that students who view lecture recordings derive an educational benefit sufficient to justify the time spent. More than four-fifths of the faculty believed that students view lecture capture recordings with sufficient frequency to warrant the instructor's effort in recording the lecture. Some faculty believed that students who view lecture capture recordings think more deeply about topics, resulting in students who come to their office asking deeper questions than would otherwise be the case. One interviewee stated, "I figure if even one student views the lecture capture [recording], it is worth my time." Without any prompting during the interviews, nearly all faculty referred to lecture capture as a tool. One faculty stated, "I just see [lecture capture] as another arrow in your quiver, another tool in the tool bag for students that certainly people my age never had." Several faculty observed that, just as with other instructional tools, lecture capture does not itself determine learning outcomes and does not replace the commitment of the instructor to interact with students and focus on their learning. Faculty perceived that use of lecture capture did not revolutionize the instructional process in traditional face-to-face classrooms, but may enhance the instructional process in a manner similar to other technology-based and non-technology-based tools. Technology continues to change the landscape of today's higher education environment. And lecture capture in particular is enhancing the educational process and has become a valuable tool for many faculty and students. Most interviewed faculty in this study believed that providing and using lecture capture technology in face-to-face classrooms was worth the investment of time and resources. When asked about the primary benefits of using lecture capture in face-to-face classrooms, three-fourths of the interviewed faculty cited students' ability to review course content for better understanding as a primary benefit of using lecture capture. Repetition is the key to learning for many students, and lecture capture recordings provide an efficient tool to accomplish this.